The WWE Moves On From Lee Leaving, Roberts and "The Crusher"
The WWE were body slammed twice this past week. The retirement of AJ Lee became the major conversation online for the majority of late Friday afternoon and evening. The news of one of the company’s top attractions and one of the more athletic talents the women’s division has had since the days of Lita and Trish Stratus left the majority of readers with their jaws hitting the floor. The girl with the cute smile, rock hard abs and a penchant for causing all sorts of chaos has left the circus for higher ground. Sometimes, you just got to love crazy chicks. And with her sudden – yet not so surprising decision, the WWE will now look to Paige to fill the kind of role Lee did – the uneven parallel of a female wrestler who can actually perform and leave her opponent and the fans guessing which character they will see on a nightly basis. The new crazy chick in town is a Casper-like athlete with a future that is bright – given she allows the company to mold her into the true superstar she is already becoming. That proverbial torch has been passed, and now we anxiously await the coming out party of sorts for a former Divas champion who must step her game up a bit. If you ask me, Paige is more than ready to keep that flame burning. 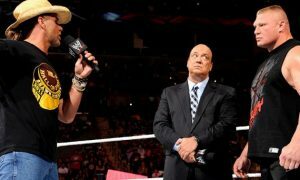 The news of AJ Lee’s retirement came the same day the company was dealing with a potentially damaging situation involving former employee Justin Roberts, who claimed the company inducted Connor ‘The Crusher’ Michalek more out of publicity than anything else. 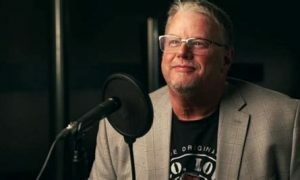 Roberts said the WWE used Connor’s battle with cancer as a marketing tool to curry favor with media and the fans at the company’s Hall of Fame ceremonies. When I read Justin’s blog, a few things ran through my mind. First, the WWE is an organization you can love and hate at the same time. Second, his words seem a bit self-centered – as though he felt he needed some validation from the fans who read the piece since he did not get it working at WWE. Third, Connor was every bit deserving of the award and maybe more so than others. The WWE fans will not identify with the guy who cleans towels. 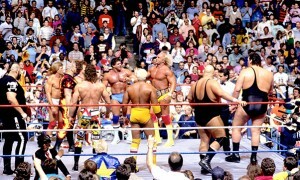 They will identify with wrestlers and characters associated with in-ring action. That is what they pay money to see. Connor’s story grips at everyone. And for the most part, Justin was paid good money to do his job. He may be the nicest guy in the world, but he got to work in a place that is Disney World in terms of wrestling royalty – good or bad. A boy who has cancer and is welcomed into the WWE family – that is the story of a lifetime. I am a writer of sports and pro wrestling and a CANCER PATIENT. I love the Connor story and its happy (yet unhappy) ending. Roberts’ comments – although they come across as genuine, also seem like a hand ended slap at the award and the care the WWE put into it. Yes, it is a feel good story and was carefully chosen. It was also the right thing to do. The WWE uses events to gain momentum – and the use of Michalek’s situation should not be viewed as a ploy to sell tickets alone. Roberts outlines in his blog but he also says he fully supported the company’s decision to put the youngster in the Hall of Fame. Sounds like he is talking out of both sides of his mouth and is bitter about the WWE’s decision to let him go. 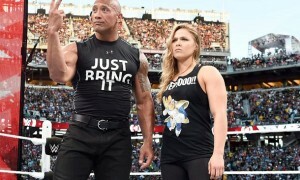 According to the Washington Post, part of the WWE’s restructuring of the story was to cut Roberts role out completely, despite the fact Roberts introduced the young boy to both Triple H and Stephanie McMahon. While the Lee situation was bound to happen, mainly because her husband, CM Punk is still a lightning rod for controversy within the WWE and fans still cheer his name at every live event, it is not unexpected. The comments made by the former employee, although they may be true, were made while the WWE is experiencing a rise in support from the WrestleMania events over last weekend. Hopefully neither eventwill bury any of the momentum the company is experiencing. Both situations may be challenging to Vince McMahon and his brand, but the reality of it is these are things that happen when sour grapes may be involved in the business. The worst thing about all of this isn’t that Lee left the WWE. The sad thing is the reasons why the WWE placed Michalek in the Hall of Fame are being questioned – something that Roberts should be ashamed of for questioning in the first place.